This post is sponsored by Command™ Brand. All thoughts and opinions are my own. Thank you for supporting content that keeps Sunny Circle Studio going! I don't know if you are like me, but when my home is organized so is my mind. A clean and tidy space gives me peace of mind and helps motivate me to complete projects, do yard work, spend more time with my family, read books and even bake cakes (kidding, but I do love to bake)! And when you combine beauty with functionality, you get the best of both worlds. I recently got my hands on some of Command's newest product line of metallic hooks and let me tell you - they do not disappoint in either of those above-mentioned categories! I have been a fan of Command® Strips for a while and use them all over my house, mostly for picture hanging. 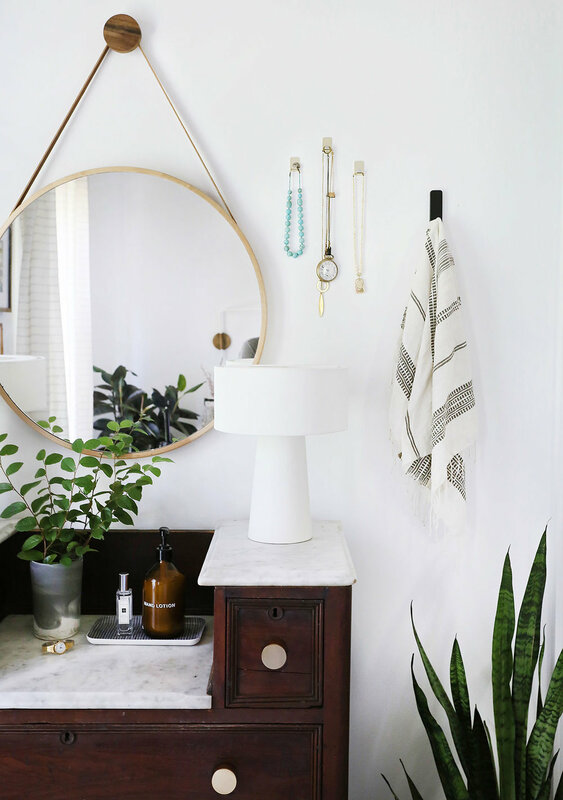 Their new metallic line of hooks was exactly what I was looking for to decorate and organize my vanity area in my bedroom, without doing any damage to my walls! I am a notorious hammer of nails into walls. No kidding, I have SO many holes in my walls behind framed artwork and mirrors. It's pretty ridiculous! I guess you could probably call me lazy and eager to hang things! With these new hooks, I was able to quickly decorate the area and move things around without even creating one single hole! The finishes of the hooks include stainless steel, brass, matte black and copper. Naturally, I was drawn to the brass and matte black because I cannot quit them! I love how easy setting up this little area was. I knew I wanted a spot to put some of my scarves, jewelry and I even threw in a quick DIY hanging frame of my kids. I literally got a piece of string and attached it to the frame, so I'm not technically sure it counts as a DIY, but I like the results! I also created a fun little hat wall with the matte black hooks that took me about 5-10 minutes to install! Cute, simple, convenient and super customizable! I had so much fun styling and getting creative with these products! I loved the sophisticated, modern finish of these hooks. Not to mention they look very luxe but are an affordable decorative touch you can add to any area in your home. If you are looking to quickly organize and beautify a space, I highly recommend them! They call it 'damage-free decorating' and I'm totally in on that!